A ration of Rum no Navy will dare to take away. It's a known fact that sailors and Rum go together like... well, like sailors and Rum. And the British Navy provided their seamen with endless rations of Rum for centuries - until the infamous Black Tot Day in 1970, when the Navy abolished the generous Spirit allowance. Nine years after the Naval Prohibition, Charles Tobias obtained the rights and the recipe, and established Pusser's Ltd. in the British Virgin Islands. They have been producing fine Rums since then and their Gunpowder Proof Rum is one of the latest additions to the roster and a lovely naval reboot. 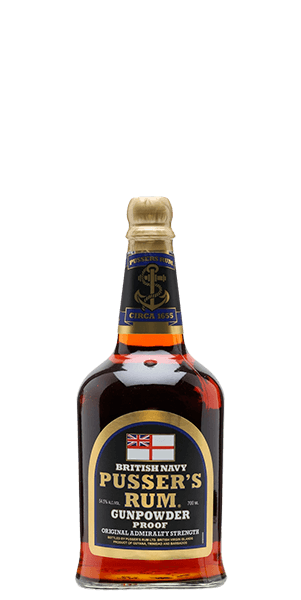 It's a traditional Royal Navy style Rum, produced at original Admiralty strength. That means if mixed with a few grains of gunpowder, this Rum should ignite like a firecracker. If Pusser's Gunpowder Proof is any indication, the sailors of Her Majesty lived a good and dangerous life out in the sea. And it's one hell of a punch, too. The aroma itself will kick you to attention, while the oak and molasses will spice up your day. But it's not all rumble and tumble with this one. There's a sweet and soothing embrace of vanilla and honey waiting for you, if you stick around long enough. So, God save the Queen and this bottle of Rum. What does Pusser's British Navy Gunpowder Proof taste like? The Flavor Spiral™ shows the most common flavors that you'll taste in Pusser's British Navy Gunpowder Proof and gives you a chance to have a taste of it before actually tasting it. Full aroma of molasses, toffee, vanilla and honey with warm notes of oak and nutmeg. Full-bodied and strong with a mellow embrace of sweet vanilla and molasses, nutmeg and espresso. Peppery spice and oak bring some balance. Long finish with spice and caramel aftertaste.